If you have damaged, discolored, or misshapen teeth, dental crowns could be the answer. Dr. Alexander Visot provides quick, convenient dental crown procedures right from his Woodland Hills, California office. In some cases, a one-day in-and-out procedure is all it takes to fit your affected tooth with a crown that can repair it permanently. Call or take advantage of the online scheduling tool to set up an appointment with Dr. Visot to find out more about this procedure. 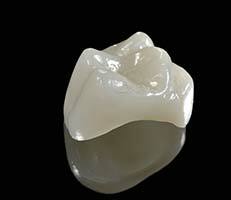 How do zirconia crowns work? Dr. Visot uses zirconia crowns, not metal ones, to cap damaged teeth. Being made from zirconium, they offer several advantages as opposed to ceramic or porcelain crowns, including being the strongest, most durable crowns on the market, as well as the best match for natural teeth. Zirconium crowns are designed for people who grind their teeth. They are metal-free and extremely strong, protecting the teeth from the force exerted when you grind them. Dr. Visot may have to reduce the size of your damaged tooth; then he makes an impression of your tooth for the crown. The impression helps him make sure the crown will fit correctly. An outside laboratory creates the crown, but in the meantime, Dr. Visot can match you with a temporary crown. Typically, a crown-fitting takes two visits. But, in some cases, Dr. Visot can do the entire procedure in one visit. Dental crowns from Dr. Visot should last a lifetime. However, in some cases, they can become loose or even fall out. After you receive your dental crown, Dr. Visot goes over detailed instructions with you on how to ensure long-lasting results. The most critical piece of advice he gives all his patients is simple: Practice good oral hygiene by brushing twice a day and flossing daily. He also schedules regular follow-up visits with you and a hygienist to monitor your oral health. Regular visits are the best way for him to ensure your crown is in good shape. Another way to prevent damage to your new crown is to avoid chewing hard foods. Call or use the online scheduling tool to set up an appointment with Dr. Visot and find out more about dental crowns and their potential benefits.